Some writer friends pointed out this cool image last week. Do you see a girl spinning counterclockwise or clockwise? Surprisingly, not everyone will see the same thing, even if they’re staring at the screen in the same moment. Seriously. And what you see now may not be what you see fifteen minutes or seven hours from now; it all depends upon which part of your brain is the most active at the time. Right now, for me, the dancer is spinning counter-clockwise–the direction, according to the article she came from, that most people will see her spin. But when I first saw the dancer–after working on my fiction for a chunk of time–she moved clockwise. This post is going to lean left brain to start because the science major in me has been activated. And something about brain discussions appeals right now–maybe because it’s nearly Halloween and I’m hungry for gummy brains. Muahaha. The problem with right brain/left brain musings is that it leaves some with the impression that we are either one or the other, left or right brained, black or white, which–unless someone actually had one of their hemispheres removed–just isn’t the case. That’s because the right and left sides of the brain “talk” to each other via a communication pathway called the corpus callosum. Scientists have been able to learn a lot about the two hemispheres through surgeries in which the corpus callosum is severed (sometimes necessary for people with epilepsy, to reduce the number and severity of seizures). But just because none of us are wholly right or left brained, doesn’t mean we don’t lean one way or the other or have preferences re: how we learn. Check out this Hemispheric Dominance Inventory HERE and see if you can ID your own leanings. Consider Time of Day. Many writers work late at night or in the wee hours of the morning when daily expectations (the phone calls, shopping, meetings, etc…) have been put on hold or aren’t yet in play. This means the left-brain stressors are low and the right-brain’s meanderings may be better heard. Less inhibited, dream-ready brains are also well-known for spewing out unboxed ideas and outlandish plot twists. Visualize Before You Write. Starting a new scene? Before you dive in, think about what your characters see, smell and taste. How do they move? How do they feel–physically and emotionally? Do you sense any strong symbolism in the scene? Have these visualizations well in hand before you think about dialogue, and your right and left hemispheres may just play nice with one another. Shut Out the World. Turn off your email and your phone’s ringer. Parents, keep your cell phones on if you must, but otherwise try to shut down all other forms of communication. Close the curtains. Put on music of choice if that helps. Write. Repress Your Inner Editor. Your editor (AKA The Critic) uses left-brain skills and can snuff out the creative efforts of your right brain by picking everything apart for faults. Shut down The Critic’s judgments of your work until you really need them–after you’ve finished your draft. Try a Writing Prompt. Plenty of websites offer writing prompts. Writers Digest, for example, updates their list weekly HERE. Or, if you like poetry, try a quick and inspired haiku at Absolute Write’s Water Cooler – my favorite haiku playground. Right- or Left-Brain Thinker quiz HERE. Are You Artistic quiz HERE. Well, the dancer is spinning clockwise again, so you know what that means. End post. Pull up manuscript. Write. 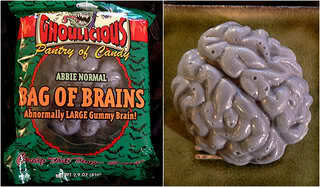 Eat a gummy brain. every time i blink, the dancer spins in the opposite direction. it was first clockwise then counter clockwise. then back, then back again. what does that mean? is this why i’m confused and indecisive or blocked? Because my brain halves are at war with each other for dominance? It’s crazy, isn’t it, Thea? I’ve heard that some people never see a full rotation, either. It sounds like both sides of your brain are working well – and working together – to try to make sense of the illusion. Write Room for Mac, Dark Room for Windows. I’ve seen the spinning woman graphic before. I see her spin both ways. Normally she’s clockwise for me, but if I look at a paragraph of text then quick look back it’s counter-clockwise. And I’m glad you made the “we use both sides” point, Therese. Especially on the web I see people talking “Are you right brain or left brained?” and it’s a somewhat irrelevant question when every individual uses both. Thanks, Eric! I added the info to the post. I think she’s got to be one of the most fascinating illusions going. Bizarre. When I first clicked on it, it was clockwise. Then when I stared at it, it went counter-clockwise. So far all I see is clockwise. I’ll have to try again later. This surprised me because I’ve always thought of myself as on the left-side brain spectrum of writers. I am closer to a plotter than a pantser (do both at times). I also use methods and tools like Writer’s Journey, GMC charts, etc…, which I know some pantsers don’t care for. I think of these tools as ways to get a dialogue going between the left and right brain: asking a logical question and getting a creative answer. Clockwise for me. Great post! When the picture of the girl was slowly loading the girl was twirling clockwise and when it loaded completely it started to move counter-clockwise. Oh, This is really, really cool!!! I could only see the clockwise. Then I read the comments, and tried to see the counter-clockwise. And eventually I could. Can you see it when it does a half rotation one way, then half a rotation the other. Half left, half right, half left, half right. Try to do that. It’s really amazing!! Oh my gosh, this is the coolest thing ever! And so very relevant to my own work/life/world right now — thank you for sharing!!! This is really cool! When I first saw her she was going clockwise….after a few minutes of focusing/practicing I was able to see either direction I wanted at that moment. Really neat! Well I’m inflexible. She is only spinning CLOCKWISE. I cannot get her to spin the other way and in fact, examining the figure, I can’t see how to. Ah well. For being in a creative moment, I don’t feel open. It’s not brain side dominance that determines the perception or clockwise or counterclockwise rotation. That’s just some smart fellow “scientist” trying to invent a reason before he actually studies the issue. The fact is (as many of you noticed) that you can make yourself see it anyway you like. Experiment a bit and you will notice that the direction is determined by your expectation of the direction in the split second you first look at the image. What we expect to see is not negated by what we actually see so the mind decides it must be so… The trick here is that this specific image will not prove us wrong no matter what we expect the rotation to be. So we can see it both ways. The fact that we “guess” reality and then we confirm it by analizing the details of what we see is an optimization our brains use to faster make sense of what we perceive. Did you notice people tend to fall down elevator shafts when the door opens and the elevator is not there. They just “know” it should be there and act accordingly. By the time the mind understands that this time the guess is incorrect … well it can be too late. Same optimization at work. Did you notice people tend to fall down elevator shafts when the door opens and the elevator is not there. They just “know” it should be there and act accordingly. The problem with this argument, ggpp, is that there aren’t any expectations when first you glance at the image. It is what it your brain makes of it. This is the neatest thing I’ve ever seen. It was clockwise for me at first and didn’t change until I read some of the text and then looked back. I can’t make it change at will – but if I relax and breathe deeply while I’m watching it will always go back to clockwise.